Vespers by Bradley Schmehl, available from Prickly Pear Galleries. Artist Bradley Schmehl see the extraordinary in the ordinary. A working cowboy sits astride his horse reading his Bible. 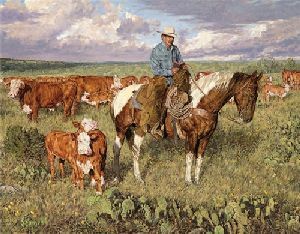 He is surrounded by all the things he finds beautiful: the herd of cattle, the frolicking calves and the sky He created. For all, he gives thanks at the end of the day. Print and canvas released 2002.